HSBC has launched Apple Pay support for customers in Australia for the first time, enabling any Visa and MasterCard branded credit card issued by the bank to be added to Apple's mobile wallet. HSBC said the majority of its customers' credit card payments are already contactless and it expects Apple Pay will be quickly embraced as part of the wider shift towards tap-and-go payments. "Our customers have told us they want to be able to use Apple Pay in Australia, and we're proud to be able to make this service available to them," said Graham Heunis, Head of Retail Banking and Wealth Management, HSBC Australia. 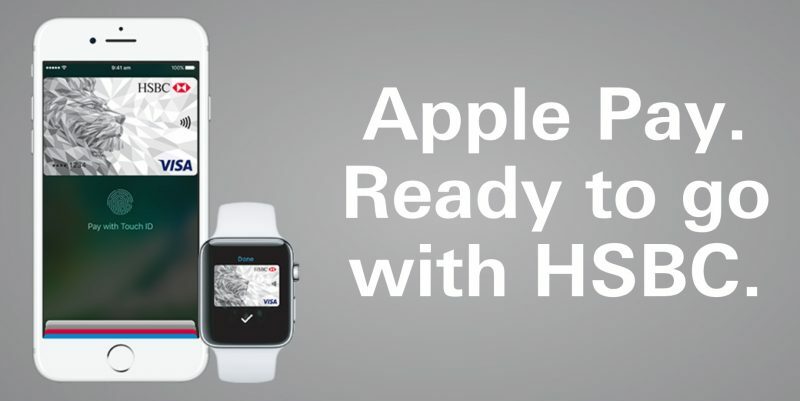 "HSBC has introduced Apple Pay in five other markets and we're looking forward to another successful launch here." The bank has set up a new Apple Pay web page on its site to guide users through the steps needed to add a credit or debit card into the Wallet app on iPhone and iPad. HSBC joins a growing number of banks in Australia which support Apple Pay, including American Express, ANZ and Macquarie. However, several major issuers such as Commonwealth Bank of Australia, Westpac Banking Corporation, NAB, and Bendigo and Adelaide have resisted supporting the payment system during their failed attempts to collectively negotiate with Apple over gaining access to the NFC chip in iPhones. The Apple Pay service is available on iPhone 6 and later, iPhone SE, Apple Watch, the late 2016 MacBook Pro, and iPad mini 3 or later within apps and Safari. Macs introduced in 2012 and later can also be used, but checkout must be confirmed through an Apple Pay-enabled iPhone or Apple Watch. Going ok 3 years since it came out and my archaic bank still does not have it, and that's after promising it would come out soon back in 2015. Why wait for some bank to get their act together?? Wouldn't be simpler to switch to a more modern bank if the existing one does not fully suite your needs? I told my bank if they didn't choose to support and implement Apple Pay, I'd be forced to switch financial institutions. They didn't so I did. Now I use it wherever I can. I just wish Apple would entice one or two of the hold out companies such as Costco, Kroger, Safeway and/or Home Depot to support and implement Apple Pay. Apple's glacial strategy of encouraging companies to get them to gradually accept and convert to implementing Apple Pay is a bit frustrating every time I use it. I yearn for the day that I will be able to whip my phone out and pay for my purchases everywhere I go! I just returned from Ireland where NFC is everywhere. I don't think Apple is the issue here. I was using my phone for paying everything. Restaurants, stores, even for bus tickets. I could be wrong, I think the retailers are the holdouts.